Indonesia seems like a far off land to many people around the world. More than 30 hours of traveling from North America gives credence to this statement. However, no amount of traveling could stop me from returning to this country again and again. Indonesia is known as the epicenter of marine biodiversity. It is thought to be the oldest ocean in the world - the first sea that formed when the continents separated from the massive super-continent, Pangaea. Being the oldest ocean allows for many more millions of years of evolution. As a result, the species diversity in Indonesia is unmatched anywhere in the world. In addition to the remarkable diversity of this region, evolution has also created some animals that are among the most specialized and bizarre of all creatures. The true champions of mimicry and camouflage reside here. Underwater Indonesia is full of stunning coral reefs and beautiful fish, but the truly strange and otherworldy critters of the muck also make their home in these waters. To dive in Indonesia is to be on the most rewarding of treasure hunts - with the prize being the discovery of remarkable creatures that showcase evolution at its finest. The critters of Indonesia are so well adapted to their environment, and the species diversity is so incredible, that new species are still being discovered constantly in this region. The blue ribbon eel is one of the more striking eels in the ocean. This species changes colors as it matures. 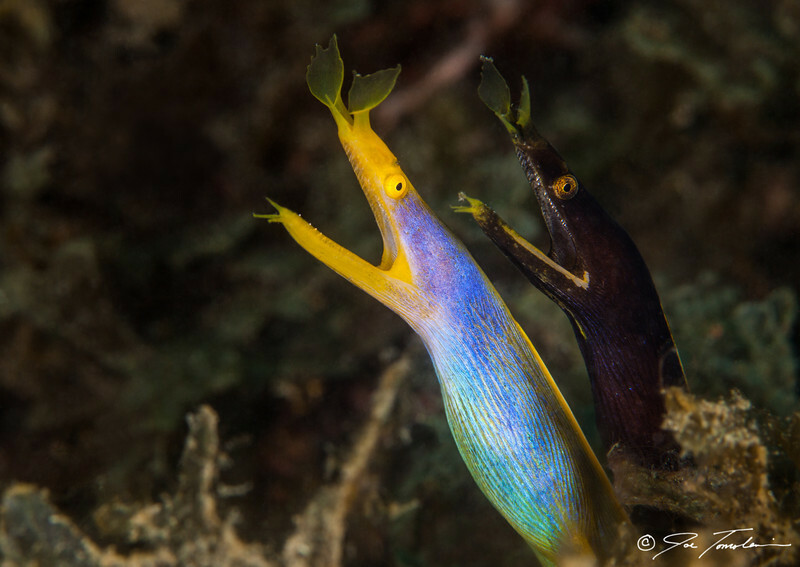 Here, we see a rare instance of an adult male (the blue and yellow eel) sharing a hole with a juvenile (the black eel). Females of this species are all yellow.